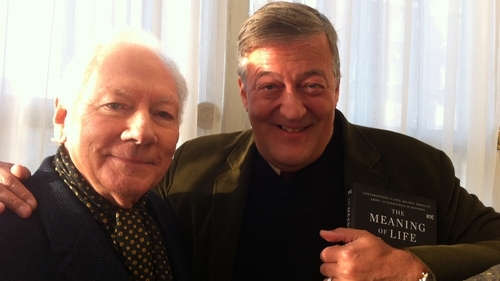 Writer and broadcaster Stephen Fry could face a fine of up to €25,000 over a blasphemy complaint following comments that he made during his 2015 appearance on the RTÉ show The Meaning of Life With Gay Byrne. During the episode of the series in which Byrne interviews notable public figures about their beliefs, Fry said that he believed God is "quite clearly a maniac, an utter maniac, totally selfish". "Why should I respect a capricious, mean-minded, stupid god who creates a world which is so full of injustice and pain?" he added. "We have to spend our lives on our knees thanking him. What kind of god would do that?" The Irish Independent reported on Saturday that a member of the public believes Fry’s comments were illegal and contrary to the Defamation Act 2009. The person said they were "doing their civic duty" and had written to Garda Commissioner Noirín O’Sullivan over the comments, but had not been personally offended, the Irish Independent said. Gardaí have said they cannot comment on a complaint of blasphemy. RTÉ also said they are not commenting on the matter. Atheist Ireland has said it welcomes an investigation into Fry for blasphemy as "it highlights a law that is silly, silencing, and dangerous." "It is a silly law because it suggests that the creator of the universe needs the Oireachtas to protect its feelings," Michael Nugent, the chairperson of Atheist Ireland told RTÉ. He added: "It is a silencing law because many Irish media outlets are self-censoring themselves to avoid the possibility of being prosecuted."